I read this article and found it very interesting, thought it might be something for you. 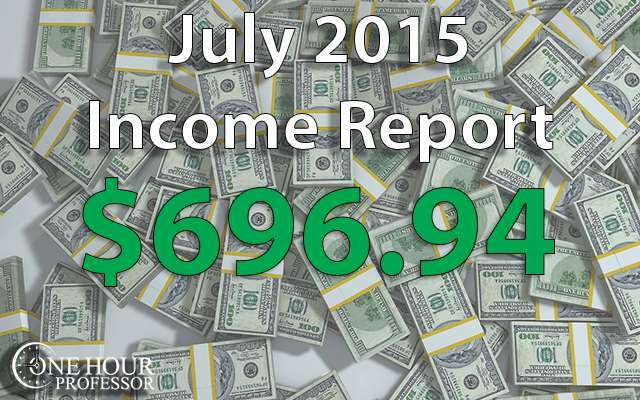 The article is called July 2015 – Monthly Income Report and is located at http://www.onehourprofessor.com/july-2015-monthly-income-report/. Here we go again with another monthly income report, and this one was another winner! There are a lot of reasons for this, and frankly I think it will continue because I have some pretty solid clients in place for freelancing gigs now, but we will talk about that later in this post. If you want to always see these income reports when they come out (and get some other cool stuff) make sure to sign-up for my email list. Before I begin, if this is your first time on my website let me explain why I write a detailed income report each month that outlines the money I made (or lost) and the time I spent working each month. Yet again, I have spent a ton of time on my Authority Website Experiment. As I wrote in my 1-day business breakthrough post I was basically told I should ditch this website completely and focus solely on a new website venture. While I was okay with focusing on a new website venture, I obviously wasn’t okay with completely ditching this website as it’s my baby and frankly, has contributed to much to my professional growth over the last year. So, I decided to create a authority website and I’ve been documenting that experience since I began. If you want to get access to my authority website archives to view all of the posts, sign up for my email list where there are all listed in chronological order. Now you’ll realize that, let’s talk about but I worked on this month. The first post I did was focused on buying hosting and a domain name for your website. Many people think that this is really difficult and technical, but actually purchasing it is very simple and this post did a great job of outlining exactly what they need to do. The next post was about how to make your website look good. This post talked about how I utilize templates (even this website was made with a template) to make my websites. My thought is, why should you spend all of your time designing a site from scratch when you can just take a template that already has a lot of cool functionality and customize it to your liking. This post talks about exactly how I do that and where I go to get these templates. The last post that I created for the authority website experiment for the month was focused on how to create great content for your website. I got some really good feedback on this one and even had a few emails of people thanking me for writing it. Many people think that in order to have a successful website you have to blog every single day and create new content all the time, but this post talks about alternative ways to create awesome content for your website and I’ll be releasing a blog soon talking about how well some of these strategies are working to get my new authority website seen. Beyond those posts, of course I created a income report for June and spent about an hour getting my social media posts created and roughly four hours completing some maintenance. Again, this month I spent about 27 hours working on my authority website and contracted out 32 hours. I know this seems a crazy amount of time, but if you understood the databases that I was creating you would realize why this is taking so long. Another month, another roughly $700 in net income. I picked up another consulting client whom I am walking through the process of getting their online business ready to go with email marketing and some other things. Beyond that, I continue to make income from other consulting arrangements that I’ve had in place for some time that were all a result of this website. I’ve had people ask me how I became a consultant, and this periscope explains it pretty well. Again, I made a little bit of income through Google AdSense this month. This is primarily through my 90% outsourced website experiment which still continues to bring in a few bucks a month. I’m anticipating that with my new authority website experiment this income should increase substantially, but I think it’s to take a few months before I am ranking for key terms so we will probably continue to see the small revenue numbers for the time being. LegalMatch, which is a service that finds lawyers for individuals who need them, contributed another five dollars this month. This is all because of one blog post which focuses on Getty images suing people for using images that have a copyright. It’s amazed me how well this particular post was done and it continues to bring traffic month after month. I was happy to see that Indeed.com brought in almost Seven dollars of revenue this month. This is almost all due to the new authority website and I anticipate this continually increasing over time. My YouTube Channel brought in $15.20 this month due to the ads that are shown on my videos. This is a little bit more than last month and because I continually update my YouTube channel with all of the periscopes that I do, I anticipate that this trend will continue. By the way, make sure you are following me on periscope if you haven’t already @RStefanski. I wouldn’t say that my new Udemy course is killing it, but it did bring in another $17.62 for the month. While this isn’t earth shattering, I’ll be happy if I continue to see this money roll in. I made a few extra bucks from Aweber because I’ve had a few random signups and I always love seeing these because the affiliate program is recurring. Expenses this month were almost all because of the authority website labor. First I have the usual recurring expenses in my Hostgator account, Aweber, and HootSuite. These are the types of expenses that are going to continue because I consider both of these platforms vital to my business. For the first time this month, I also had an expense from Ring Central. What this is a fax number that I am allowing a freelancer to use to get faxes to create one of my databases. While this may not make sense yet, I’ll be disclosing what my authority website is soon enough and you’ll understand why I need this. Again, the highest expense this month was from Elance.com. The cost was just about $500, but this is money well spent and I’m already seeing some pretty great results from the work that’s being done on the authority website including quite a few people linking back to it. In my next blog post, I’ll disclose what it is that I’m doing to make this happen. Did I Meet my Goals for July? COMPLETED! I wasn’t able to complete my e-book which is one of the things that I’m using to build my email list, but I’m still actively working on this and think I can get it done by the end of August. My advice to everyone out there is always create to lead magnet’s for their website. Both of these have to be pretty general and the reason why I do this is because you want to make sure that you appeal to all customers. One of my lead magnet’s has been completed and the other one is my e-book which I’m still working on. All in all, I would say that I deftly created the lead magnet and have for the direction on what it is that I need to complete moving forward. I’m happy to report a clean sweep of my goals for the month of July. I was able to stay profitable and will continue to keep this goal as it so important for my business to continue to move forward. I made a goal for myself to write for at least 30 minutes every single day for the entire month of August. I figure if I’m able to do this, I should be able to complete my e-book in no time. I’m not sure that I’ll have my proofreading done by the end of August, but I definitely want to get all the content and my ideas on paper. Again, this e-book is specifically for my authority website experiment and it’s already reached 35 pages. As many of you have realized from his blog posts, I tend to be a little long-winded in my writing and this is shining through in my book as well. You read it right. I intend on disclosing my authority website by the end of August. I know that we’ve been talking a lot about a fake phlebotomy website, but I want to disclose what the actual website is and have all of you understand what it is that I’ve been working so hard on for the last few months. I’ve spent some time listening to some additional podcasts and realize that I’ve been doing something wrong for some time. You see, like many of you have struggled with, I tend to create content over and over without sharing it with people who may enjoy it. This is obviously foolish and something that I need to stop. Because of this, I’m going to work really hard to make sure that all of the content I create has the potential to be shared either through social media or through links back to my website by people who might be interested in. Basically, I’m going to try to become more social with my content because of been told it’s really good and I do myself and others a disservice by not sharing it with those who may enjoy it. Thanks for the encouragement, Bharat! I appreciate the comment. Hey Ron, Wow Im really looking forward to seeing how your authority website experiement pans out. Im pulling for you. Anyhow, thanks for posting, Ive updated your income on the The Ultimate List of Blogger Income Reports! Thanks Alexander! So far, so good. Thanks for including me!